After completing the rehab on my previous piece, it sold almost immediately. 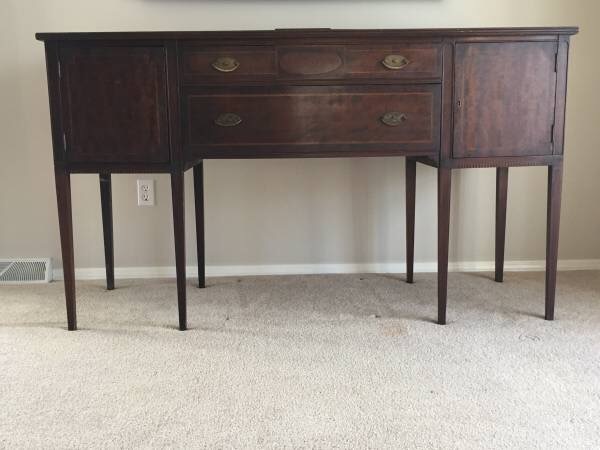 This was a double blessing, as I received a call from a sweet young woman wanting me to find/resource a buffet for her since the Drexel piece was no longer available. She came over for a visit and to look through some of my portfolio of past rehabbed pieces and decided to move forward. My client, darling 25 yr old professional, had just moved into her very own condo and was looking for something to be multifunctional for years to come. For now, this will serve as her entertainment center for her flat screen. Within 24 hours of that meeting I was picking up this gem. 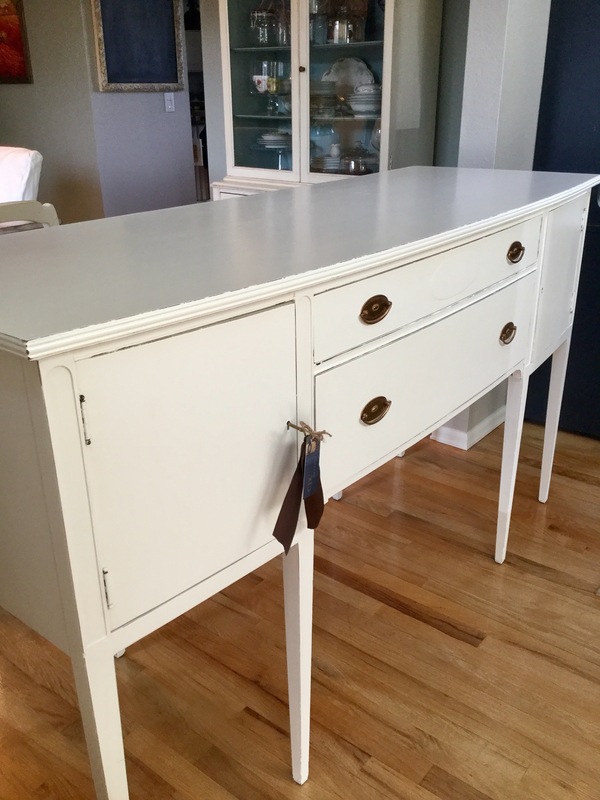 Excellent bones, smooth operating drawers and cabinet doors, very sturdy piece, all original hardware, locking skeleton key for the cabinets and unique with it 8 lovely legs. The stain on the top was quite damaged with water marks and what not. Additionally, I could tell that the age of the stain was likely going to produce a great amount of ‘bleed through’. After a good wipe down I gave it a good once over with some sand paper and cleaned it well with tack cloth. Let the priming begin. One coat of primer seemed to be sufficient. Moving right along, I lightly sanded the primer and cleaned the piece again. 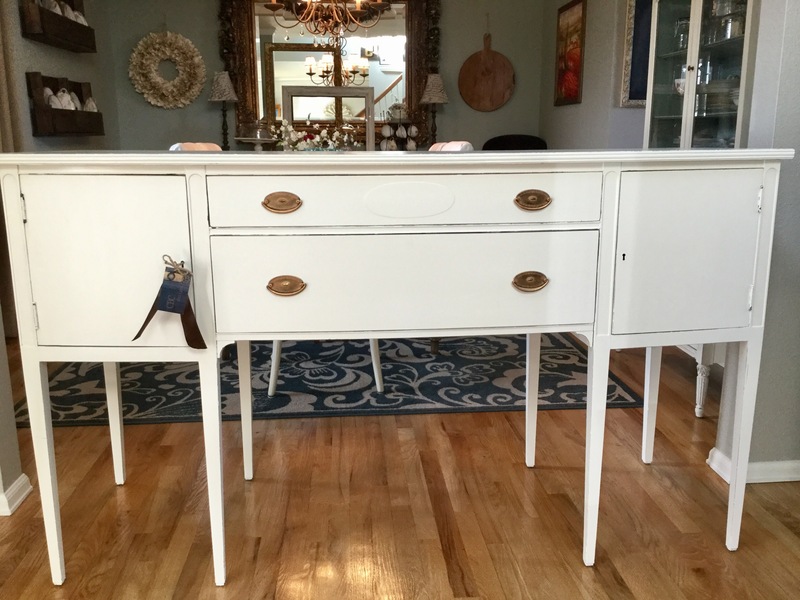 My sweet client knew she wanted white, so I went with my all time favorite with, Alabaster. It’s a Sherwin Williams color that I have always had mixed in Behr premium. I’m a HUGE fan of Behr paints, and sadly, they are not giving me a little kicker bonus to say that. It’s just the truth. When the first coat dried I could see the bleed through beginning. Because I always apply two coats of paint, I wasn’t worried. However, after the second coat there were a few areas still faintly showing some bleed through so on went a third coat. Creamy and beautiful was the end result. 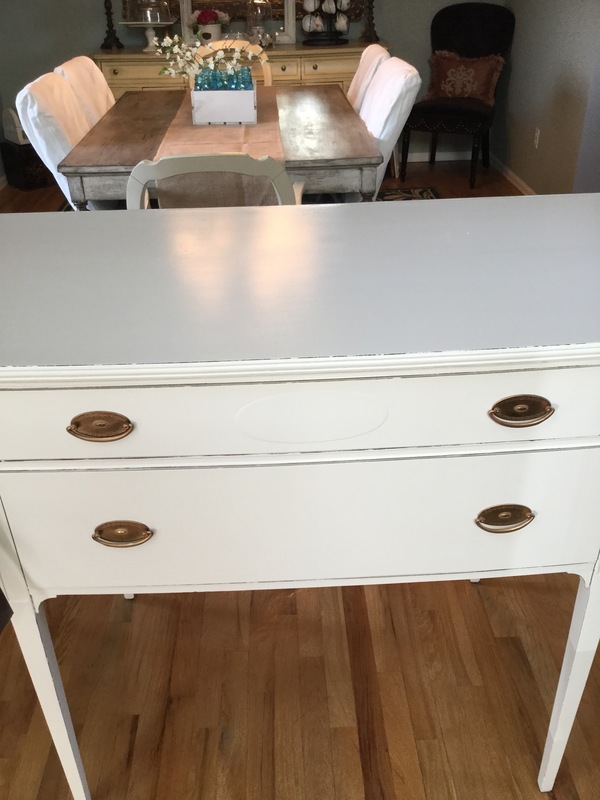 I allowed the paint to cure really well and then elegantly distressed the buffet with 150 grit sand paper. The body of the piece was given a coat of clear wax but the top needed more durability than anything wax has to offer. 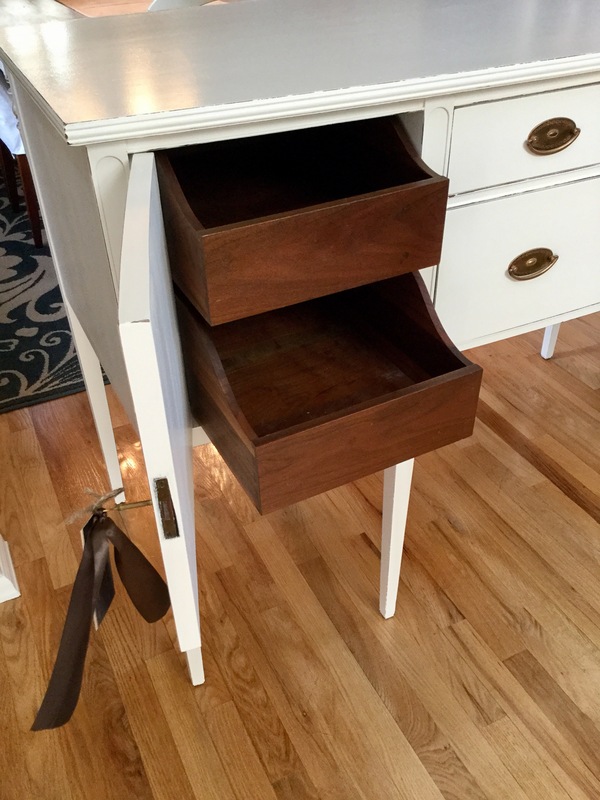 Anytime I recreate a piece that has a possible activity surface (table top, dresser, end table, buffet….etc), my ‘go to finish’ is Minwax wipe on polyurethane. It’s a charm to use, still allows a hand applied finish and you can record multiple times after each coat dries. 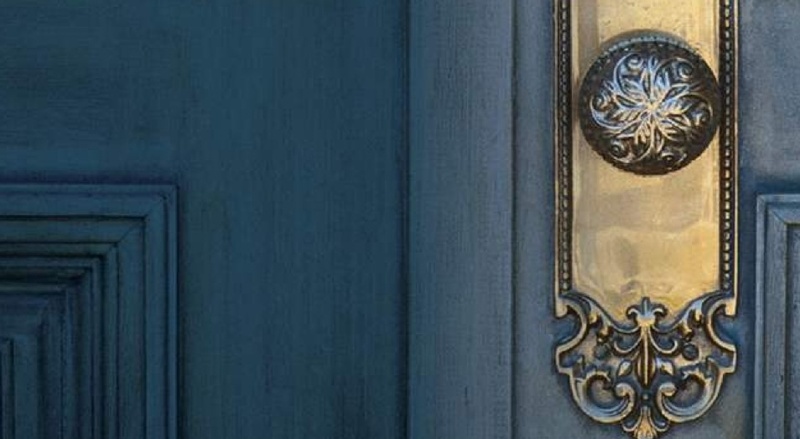 For me, and my pieces, three coats is the magic number. That way I know it has sufficient durability to withstand a lot of use. 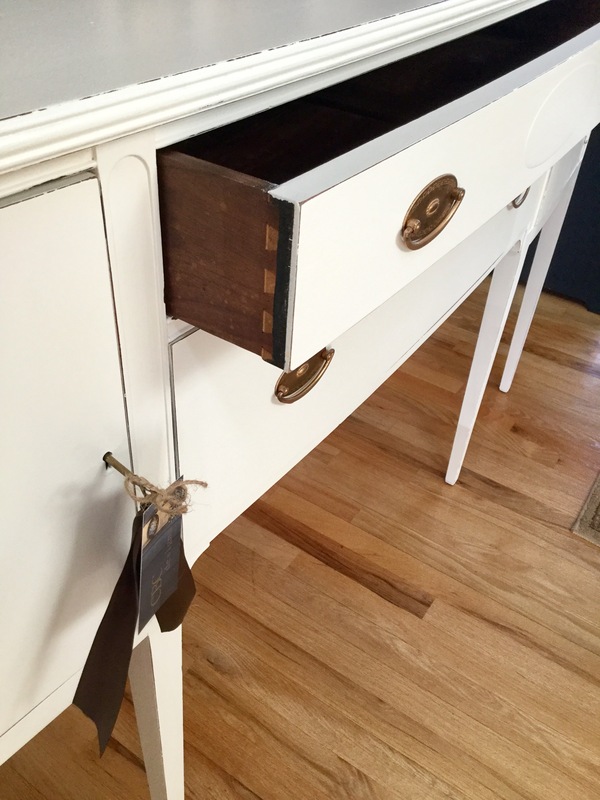 The original hardware was rejuvenated with some antique gold Rub n Buff. LOVE that stuff. And it added the perfect pop of gold against the creamy white. My darling client and her boyfriend pick it up yesterday, I think she was over the moon. It certainly turned out so elegant. I have never been a fan of wood paneling on walls. I’m talking about Brady Bunch esq’, 1970’s, brown, thin, laminate type paneling??? No thank you. 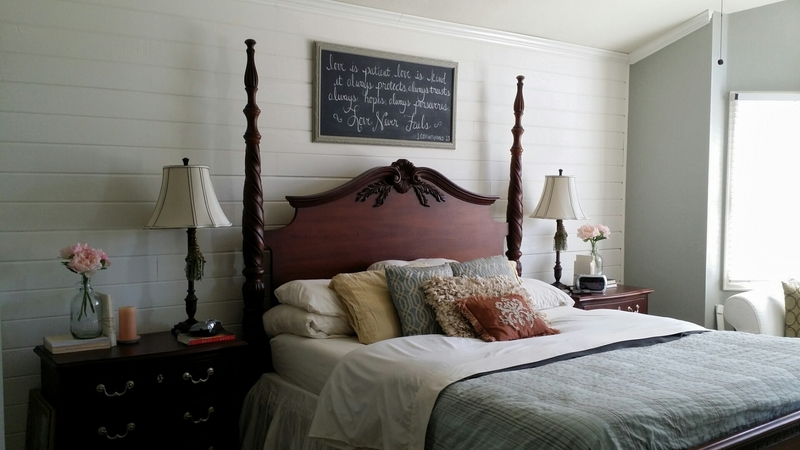 However, solid pine, tongue and groove, white, shiplap type paneling….makes my heart skip a beat. 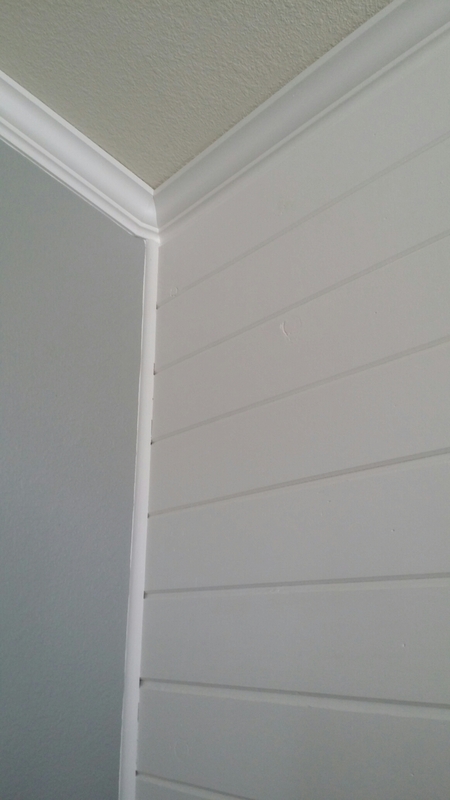 If you’re a lover of all things Fixer Upper with Chip and Joanna Gaines (like me), then you understand the type of Shiplap I am referring to. I’ve been dying to add some to the focal wall in our bedroom. So a few weeks ago, my awesome and handy hubby helped me to make that a reality. 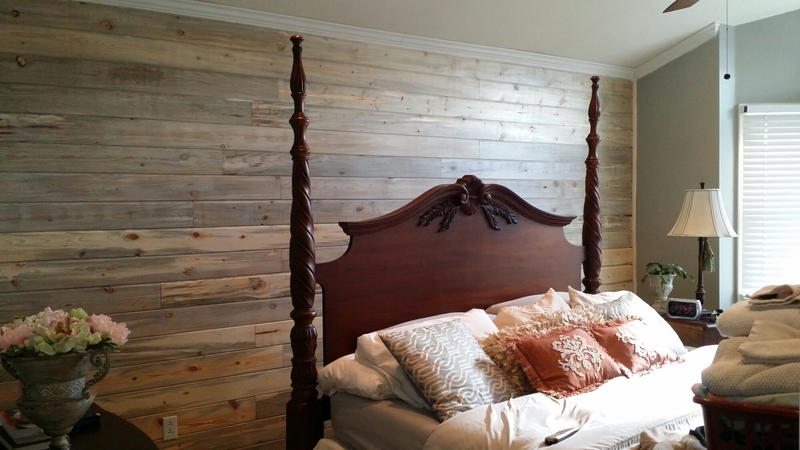 We simulated the look of shiplap but did not use traditional shiplap. 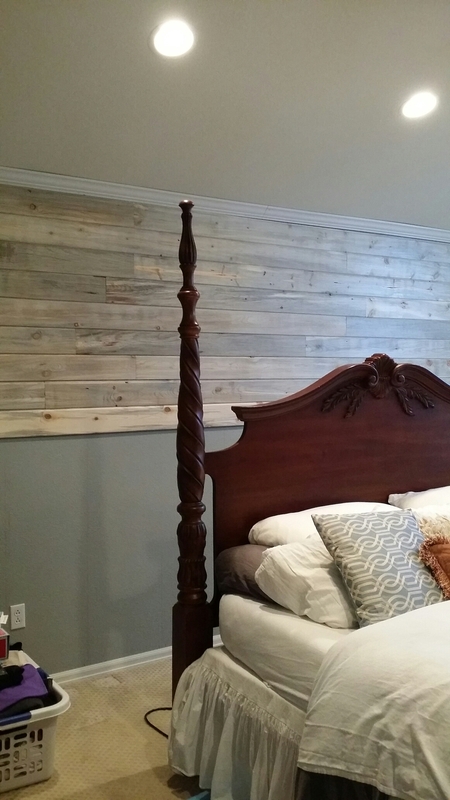 Rather, we purchased solid pine, tongue and groove boards from Home Depot that measured 6 inches wide by 8-10 feet long. 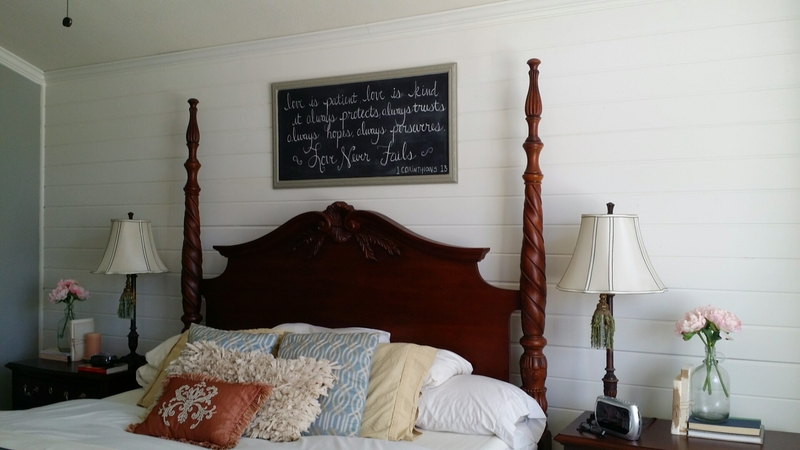 And mainly because they gave the same effect at a reduced cost (approx $2.50 less per board than regular shiplap). My husband is a step away from Bob Villa and has just about every tool we might need for any home improvement project big or small. What a guy. We began by locating the wall studs and marking them with a pencil. This way we know where to use the nail gun. You could go an extra step, as we have read, and use some liquid nails as well….but truly that seemed like over kill to us. Normally, you would begin this process from the floor up. We did it in reverse, guess that’s just how we roll. But seriously, we did that because we found out by way of doing crown molding in our bedroom that our ceilings are not exactly level. So, knowing that the crown is absolutely level, we wanted to start where we knew things would look right. I’d rather have a small gap or an issue at the floor (preferably behind the bed) than up at the ceiling where I will stare at it constantly. Make sense? After we lined up the first boards, things moved along pretty smoothly. With each new row we measured the board, cut them to size and staggered the seams, sort of randomly really. (Have I mentioned how MUCH I love to use the nail gun? OMG…its addicting). We weren’t going for a specific pattern. And some of the wood has knots and imperfections which I feel just adds to the rustic charm. When we got to the bottom near the baseboards there was only a small gap on one side of the room. 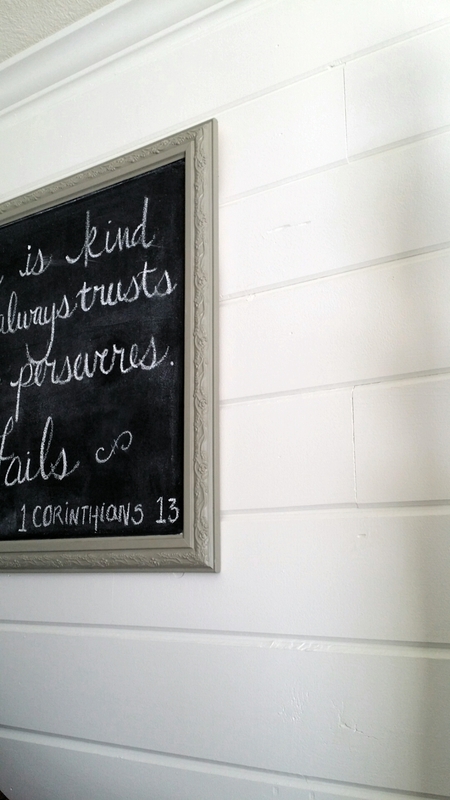 We knew this would be the case because of the issues that we had when we first hung our crown molding. I filled it in with extra caulk and no one will ever know except us. Then my husband measured and cut the quarter round trim pieces to add in the corners of the wall. Moving right along with all of your supplies on hand, one could probably finish the wall within a few hours. It took us a couple of days because my husband was leaving town on business. And then of course, I had to paint everything. This is how it look before priming and painting. It’s lovely if you’re going for that blue Pine, very rustic look. I knew from the beginning I wanted mine White. And I love the end result. Now, I’d like a new bed frame. I’ve been on the hunt for something a little less ornate and probably upholstered. We shall see. Until then, I’m loving the wall and I’d like to do a few more walls in the house.